Browse our full range of edible pulse and dried bean seeds below. These varieties are primarily grown for their cooked, protein and fibre-rich shelled dried seeds, although some can also be eaten fresh when young, check the growing notes of each variety for more details. All varieties are open pollinated and GMO-free. For fresh bush beans, fresh climbing beans, broad beans and tropical podding beans please visit our Bean Seeds page. Adzuki is a Japanese bean vine that produces long pods with 6-8 small red beans inside. Harvest when pods have dried. 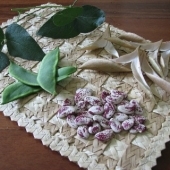 Traditionally boiled and sweetened to make red bean paste for use in desserts. 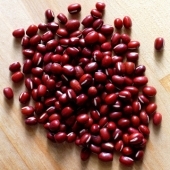 Adzuki beans can also be eaten as a pulse in savory dishes or sprouted. 16-18 weeks to harvest. 50 seeds per packet. Lima Bean 'Madagascar Bean' is a vigorous, perennial tropical bean with pods that each contain 2-4 large purple speckled seeds that can be peeled and eaten raw or steamed when young or cooked as a dried bean. It grows well in hot, humid conditions. 12-15 weeks to maturity. Each packet contains 14 seeds. 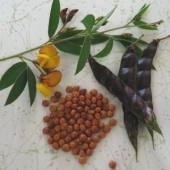 A popular pulse in India, Pigeon Pea is a large shrub which bears prolifically. It can also be used as poultry forage, compost material or as a windbreak planting. Each packet contains about 30 seeds.